The 2013 winter issue of the AEMS Newsletter includes for reviews that should be of interest to a variety of audiences. "Families of the Philippines," reviewed by Roger Bresnahan, will probably find most interest among educators working with younger learners. Per KvÃ¦rne offers a review of "Bon: Mustang to Menri," a film which draws attention to the relatively little-known Bon religion of Tibet, which has long found itself in the shadow of the much better known Tibetan (Geluk school) of Buddhism. "Woman Rebel," reviewed by Tim Lubin, should be of particular interest to those teaching about women's issues and women in Asia, and last but certainly not least, Ryoko Sakurada describes for us and highlights the value of the film work of an ethnologist in China in the 1980s. With the rapid changes China has undergone in the last three decades, this film in particular may constitute a record of local life and culture in China that today may be increasingly hard to find. Directed by Eleanor Marquisee. 2011. 30 minutes. Through this predictable formula, the series can easily lend itself to comparative social studies, especially with the online teacher's guide containing a compendium of economic and societal data. The images provide a rich understanding of how people live and dress in their ordinary lives. The narrators are a 12-year old boy named Khim, who is in the first year of high school, and a 7-year old girl named Shahani, who is in middle school. Khim lives with his grandparents in a coastal village on the island of Cebu, and Shahani lives with her parents and a younger sister in a market town in Bulacan on the island of Luzon, 50 km north of Manila. Khim attends a school with ten thousand other students, tends to the family's small goat herd, gathers wood for the fire in the outdoor kitchen, and is responsible for starting the rice for dinner each day. On his walk home from school each day he stops at an arcade to watch youtube videos. Shahani is also in a large school - five-thousand. She and her younger sister take dance lessons taught by her father, who also works on weekends as a children's entertainer at a Manila area mall. Both of the children subtly demonstrate the efficiencies of their family's lifestyles within their own environments. For example, Khim pointedly comments that the bamboo-slat floors of the home allow sand to drop through and air to circulate. Khim also demonstrates that the chickens, goats, and family garden plots contribute to self-sufficiency. Directed by Tad Fetttig. 2011. 52 minutes. If you say "Tibet," the next word that comes to mind will probably be "Buddhism." This is all the more likely as by far the most famous Tibetan is the Dalai Lama, the charismatic Nobel Peace Prize laureate (1989) who for decades has traveled all over the world to spread his message of compassion and individual responsibility to statesmen as well as countless ordinary men and women. Yet - and this may come as a surprise to many - not all Tibetans are Buddhist, even aside from the tiny Muslim and Christian minorities inside Tibet. 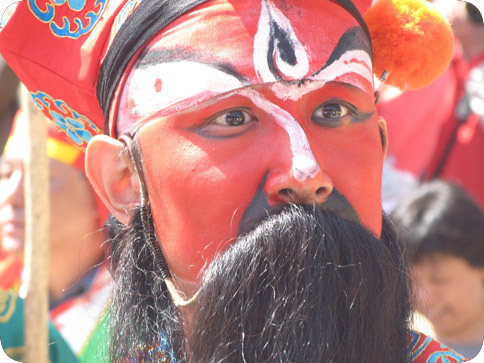 Many Tibetans are followers of a religious tradition known by its Tibetan name "BÃ¶n," which is found especially in the eastern and northeastern parts of Tibet, i. e. in areas lying outside the so-called Tibet Autonomous Region, but within the historical and cultural borders of the Tibetan nation. It is a belief shared by all Tibetans that BÃ¶n was a flourishing religion in Tibet, especially at the royal court, at the time when Buddhism was introduced in the 7th and 8th centuries CE. As opposed to Buddhist Tibetans, however, the followers of BÃ¶n (known as BÃ¶npos) claim that BÃ¶n rather than Buddhism is the universal, true, and most effective path to spiritual enlightenment. Furthermore, they maintain that the founder of BÃ¶n, TÃ¶npa Shenrap ("The Teacher Shenrap"), was the ruler of a kingdom to the west of Tibet, and that he lived long before the Buddha appeared in India. Hence BÃ¶npos, in spite of sharing a common culture and way of life with other Tibetans, including a well-established tradition of monastic life, regard themselves as representatives of a distinct religion, and this is how by other Tibetans regard them as well. Directed by Kiran Deol. 2010. 37 minutes. In English and Nepali, with English subtitles. From 1996 to 2006, Nepal was wrenched by a bloody internal conflict that pitted a Maoist-inspired insurgency against a dissipated monarchy presiding over a weak parliament. Kiran Deol has produced a moving film that recounts this conflict through the eyes of Uma Bhujel, "codename: Silu," a poor village girl turned revolutionary. Interspersing scenes of her in uniform in the People's Liberation Army, archival footage of battles, insurgent training camps, and political events, and interviews with Silu and members of the family she left behind, we follow her rise from footsoldier to battalion commander. When peace is negotiated in 2006 and the Maoists enter the political process, Silu is elected to the new Constituent Assembly. Now we see her as an increasingly confident and articulate politician, returning at last to her native village to be reunited with her parents and childhood friends. Throughout it all, Silu frames her decision to join the revolution in terms of her aspiration to improve the condition of women in her country. We hear of a galvanizing tragedy from her childhood: the suicide of her older sister, who had been married off at twelve and mistreated by her in-laws, only to return home and hang herself in despair. The film opens with scenes of women sweeping and winnowing rice. In a voiceover, we hear Silu: "They used to say that when the rooster crowed, the hen could only listen. They used to say that when the women pick up guns, they won't work." Silu was attracted to the Maoists by their egalitarian ideology and their rejection of traditional class and gender disparities. 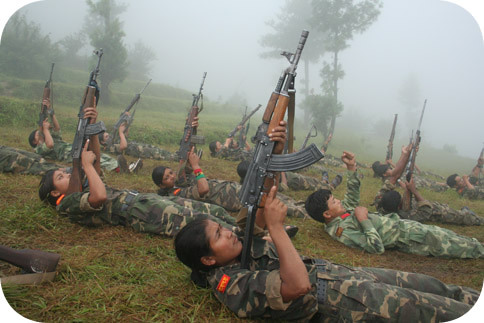 40% of the Maoist combatants were women, and she was proud to wear the uniform and fight alongside the men. Directed by Patrice Fava. 2009. 45 minutes. Reviewed by Ryoko Sakurada . This film is a unique ethnographic documentary on China in the late 1980s by French scholar and filmmaker, Patrice Fava. With support from local researchers, the Chinese Ministry of Television, and local television networks, Fava dexterously did most of the camera work, sound engineering, directing, and editing by himself in order to describe dimensions of Chinese life and worldview through the eyes of an ethnologist. In the film, Fava travels across the People's Republic of China from the big cities of Chengdu and Shanghai to the small villages of Hunan and Shanxi provinces. There, he observes people's ordinary lives and beliefs, and as an ardent ethnologist, he visually records, in detail, what people were eating, celebrating, cherishing, talking about, and praying for. In this way, we can relive the experiences of the ethnologist, seeing firsthand where he went and what he saw in China. At a glance, however, audiences may have an impression that the film is just filled with a series of scenes of lively China. Fava does apparently seem to pick up eye-catching scenes at random, but the smooth sequence of scenes vividly depicts an image of China in which the beautiful resonance between human beings and nature is observed. Also, the rich visual description of people's ordinary lives and faiths in China during the late 80s should be highly appreciated as valuable firsthand ethnographic data for this era. The film begins with the scene of a Buddhist monastery in Chengdu, the capitol city of Sichuan province. On July 5th, Fava's camera captured images of devoted monks and nuns pursuing closing day rituals at 6 o'clock in the evening. He describes how the religions and myths of China have been maintained for over 1,000 years. Depictions of colorful images of people's lives are followed by a sequence showing people's practices of Duan Wu Jie, also known as the Dragon Boat Festival, on the fifth day of the fifth lunar month. AAS Film Expo 2013: Extraordinary Lives, Everyday Asia will take place Thursday, March 21 - Saturday, March 23 at the Manchester Grand Hyatt in San Diego, CA as part of the Association for Asian Studies annual conference. Organized by AEMS since 2011, AAS Film Expo 2013 will feature twenty-eight Asia related films produced by scholars and independent filmmakers. While most of the program is dedicated to documentary films on Asia, please note that each evening concludes with an independent feature film. Short Q&A's with filmmakers and film representatives follow many of screenings. The AAS Film Expo 2013 Screening Schedule is available here. If you are planning to attend the conference, please stop by Maggie on the 3rd level of the Manchester Grand Hyatt to view a film or just to say hello. If you miss a scheduled film, you may have the opportunity to view it in our new on-demand viewing space next door to the screening room. All screenings are free and open to the public. Conference registration fees are not necessary for attending AAS Film Expo 2013.